I live in Piqua, Ohio and I have done some research on the towns history. My house was built in 1920. 7 years after a flood that took out half the town in 1913. Piqua was also the main area where the Shawnee Indians lived. In fact the neighborhood where I live is called Shawnee. The Shawnee Indians would raid American settlements in Kentucky witch lead to the Battle of Peckuwe near Springfield, Ohio. So a lot of history in this area and I wanted to pick up a hobby. 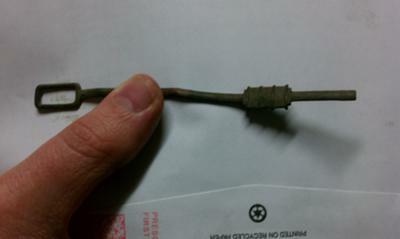 Now I just bought my first medal detector two weeks ago and its been killing me to see what I can do with it. Its been cold and I've been waiting for it to get warm, spring can't get here fast enough. When I got up this morning I thought I would try my medal detector out in the backyard but we had freezing rain last night and a could mist all day. So like a kid with a new toy I said what the heck I'm going to try it out anyway. I was disappointed when all I could find was rusty old nails an old pipe cap and some pull tabs but then I came across something and I don't know what it is. It looks cool and the first thing I thought was it looked like some old civil war relic or something. Maybe someone on here can tell me what it is or how I can find out what it is. Looks like its copper or brass, completely flat and I think it's too thin to be a key. I also found a thimble in the same area where this was.it was crushed and it seemed to be made out of the same metal. I did give up looking around the yard because it seems like there is a lot of trash in it. A bunch of nails and metal scraps. I think what you may have is a "key" for opening old-style tin cans. The key was lightly glued or soldered to the top of the can and it could be pulled free. It had a slit into which a narrow tab near the top of the can was inserted. As the key was turned, it would wind around the circumference of the can, removing a small band of pre-scribed metal, thus opening the can. This style of can has been abandoned largely because of the razor sharp edges as well as advances in packaging technology. Hi Leslie, welcome to the hobby. Thanks for your story and the picture. I'm not sure what you found, but it does look like some kind of key. Perhaps someone can identify what you found. Keep us posted with what you are fidning. It's not a tin can opener. The eye of this item is too big to be a tin can opener. Please describe the attached item on the right, is is metal, plastic. what kind of surface is it, screw threads?